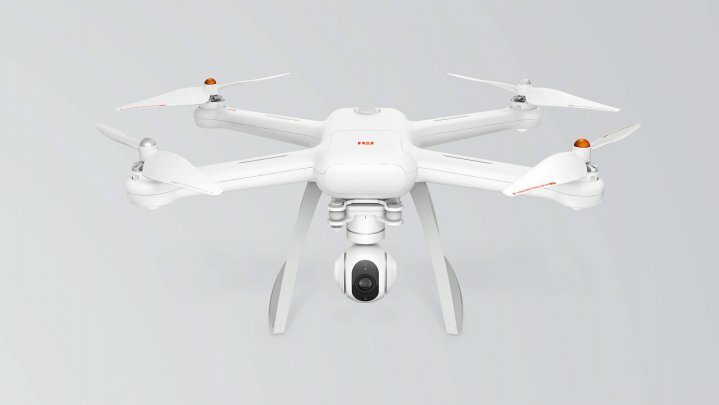 Xiaomi unveiled the Mi Drone, a 4K camera-wielding quadcopter that looks more than a little like DJI’s Phantom series. Mi Drone is a quadcopter along with a 3-axis gimbal, 4K camera, and a remote control that uses your Mi smartphone as its viewfinder. This 4K version retails at 2,999 yuan (just under $460), while the 1080p model is priced at 2,499 yuan ($380). Typically, 4K-camera drones from Yuneec and DJI retail for more than $1,000. The Xiaomi Mi Drone carries a ball-shaped 4K cam beneath it, which quadcopter-buffs might think looks similar to the built-in shooters found on Yuneec’s Typhoon series. To be specific, Mi Drone camera uses a Sony 12.4-megapixel sensor that can capture video at up to the 3,840 x 2,160 at 30 fps; and as you’d expect, it can take RAW photos. Its detachable gimbal does 3-axis stabilization which corrects itself 2,000 times per sec, and this is assisted by an optical flow sensor positioned between the camera and the battery bay on the back. This new drone has a 5,100mAh battery, which is also easily replaceable, and Xiaomi claims that the unit can get 27 minutes of flight time on a single charge, which is at the high end of what most consumer quadcopters offer. Flight path planning and point-of-interest orbiting modes.